The Xiangtangshan Caves Project was conceived as a collaborative initiative to further the understanding of the rich art and visual culture of the late Northern Dynasties Period in early medieval China. Numerous important archeological finds and reports of long-abandoned caves and other sites from this period in recent decades have awakened international scholarly interest, particularly in the Northern Qi dynasty (550-577) that produced a large body of important works of art during its brief existence. A central achievement of the period is the complex of Buddhist caves of Xiangtangshan and their stone sculptures, created near the Northern Qi capital with official sponsorship. Unfortunately, the cave shrines are now severely damaged and the sculptures and fragments of carvings from the cave sites scattered around the world. 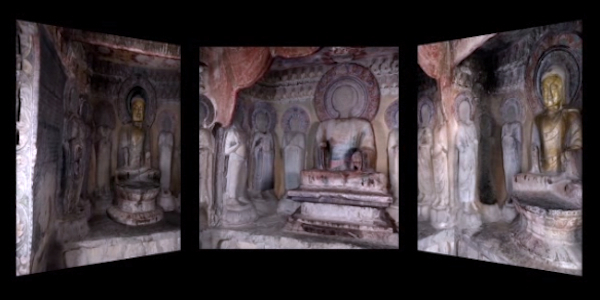 The Xiangtangshan Project has sought to acquire a better understanding the caves in broader narratives of the art and visual culture of the Northern Qi period and of the history of Buddhism in China. 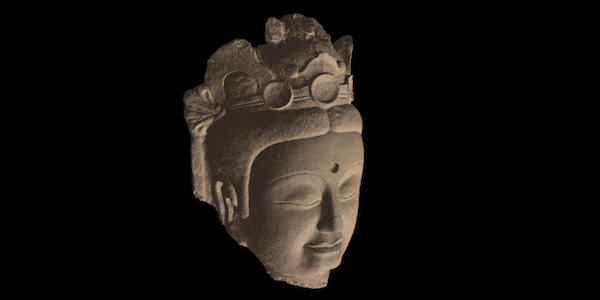 Its components and objectives were to 1) to conduct collaborative research, 2) to create a digital database of images and information on the caves and sculptures of Xiangtangshan, and 3) to present of the results of research with digital reconstruction of the caves, an exhibition, and international conferences. This website serves as a database of the project's results and a resource for future research. The Chinese Buddhist cave temples of Xiangtangshan, “Mountain of Echoing Halls,” are a group of worship halls or shrines hollowed from limestone cliffs with carved sculptural images. They are now located in a rural and coal-mining area, the Fengfeng Mining District of southern Hebei Province, where a total of about thirty caves are divided among three sites. This study focuses on the early caves, which can be dated to the Northern Qi dynasty (550-577) and which represent the major achievements of cave-construction in this area. Formerly situated in the vicinity of a political and cultural center, the Northern Qi capital at Ye, these caves were created with the support of the royal family and officials and the advice of Buddhist monks active in the area around the capital. The two main groups of caves are known as Northern and Southern Xiangtangshan. The Northern Group, Bei Xiangtang, is the earliest and largest in scale and has three caves begun with imperial sponsorship; the Southern Group, Nan Xiangtang, has smaller caves numbered from one to seven; and a third site at Shuiyusi, also known as Xiao Xiangtang or “Little Xiangtang,” has one Northern Qi cave with sculptures. The caves were richly carved with images of Buddhist deities, architectural and ornamental details, and the texts of Buddhist scriptures. These elements can be understood to represent various religious concepts and cultural ideals of the multi-ethnic society of the time and to be the result of generous official sponsorship of Buddhism. Their conception and design are related to the scholarship and teaching activity of eminent monks of the time, and to popular religious beliefs and practices. No contemporary sixth-century record of the creation of the caves survives at the sites. One Northern Qi period inscription, dated 572, dedicates the engraving of Buddhist scriptures. Later inscriptions, carved to record additional work and repairs, mention the beginning of cave-making in the Northern Qi. Together with the carved images themselves and their relationship with other datable Northern Qi sculptures, they provide evidence for assigning these remarkable caves to the second half of the sixth century. The rich and complex contents and artistic achievement of the Xiangtangshan caves is not readily surmised today because of extensive damage to the sites. Some of the loss is attributable to the erosion and natural events over the passage of the centuries, but the loss of sculptures has mostly been perpetrated by relatively recent human activity. The fine quality of the sculpted images made them a target of looters in service of the art market beginning in the early twentieth century. The plundering began around 1909 during the period of severe political upheaval that saw the collapse of the last imperial dynasty and the establishment of the Chinese republic in 1911. The relative isolation of the caves from urban centers left them vulnerable to large-scale pilfering over several decades. The free-standing images that were in the caves have mostly been removed, and many relief elements are missing, forcibly cut away. Nearly all of the heads and hands of the remaining images are gone. Sculpted figures and fragments from the caves first began to appear in museum and private collections around 1913. Several large standing figures were published in the Burlington Magazine in 1914. The volumetric modeling, large scale, and fine detailing of these limestone sculptures makes them among the most impressive of Chinese sculptures in many museums in the West and in Japan. Around one hundred sculptures or fragments are known in museums and private collections in Europe, Japan, Taiwan, and the U.S. The first photographs known of the caves were mostly taken by Japanese photographers in the 1920’s and 1930’s, after extensive damage had already occurred and many sculptures removed. They show repairs that were made so that the caves could continue to function as religious sites, but the new figures and replacement heads were poor substitutes for the originals. The photographs are a valuable record of the condition of the caves in this period. During the Second World War and in the early years of the Peoples Republic the caves experienced further damage. Those at the Southern Group, located near the village of Pengchengzhen and at the edge of the coal-mining town of Fengfeng were used as storage for a munitions factory and then a people’s daily newspaper in the 1950’s. The remaining damaged sculptures and fragments were removed from some of the caves so that they are now virtually empty. Some still remain at the site. In recent decades the cave sites have been under the official supervision and protection of the Fengfeng Mining District Office for Preservation and Management of Cultural Relics. Environmental pollution is now the most serious threat to their existence. The caves are situated in a rural coal mining area with severe air pollution from mining and the operation of coal-fueled electrical power plants, ceramic kilns, and cement factories. The combined effect of acid rain and cement dust is taking a visible toll, particularly at the Southern Group of caves on the on the edge of the town of Fengfeng. The use of explosives for quarrying stone in close proximity to the caves is a threat to the Shuiyusi site. The location of the monumental caves at the Northern Group on a mountainside above a rural village, gives this site an advantage over the other locations. It is today a frequently visited religious site where people make offerings to the images and where popular festivals are held annually. The caves and their contents can be discussed under three principal subject headings: 1] the architectural forms, 2] the carved images and their arrangements, and the 3] engraved scriptural passages. 1] Architecturally, the caves were designed as structures of one or two stories with a domed roof. These are a type of stūpa, constructions deriving from Indian burial mounds for the relics of the Buddha and developed different forms over the centuries with the transmission of Buddhism across the vast reaches of Asia. According to Buddhist textual sources, after the historical Buddha’s death in the sixth century BCE his ashes or relics were divided and buried in seven stūpas. In the third century B.C. the Indian emperor Ashoka divided these and distributed them across all of his empire. The legend of Ashoka credits him with the miraculous construction of 80,000 stūpas in a single day. The stūpas changed in form over time and across geographical regions from hemispherical mounds, to constructed stone and brick monuments with raised central domes surmounted by multiple layers of umbrellas to towering structures and multistory wooden buildings known as pagodas. The stūpa came to be the identifying feature of Buddhist temples and monasteries. In the late Northern Wei dynasty, stūpas took the form of a multistory structures that could rise to great heights, the most extreme case being the celebrated stūpa of the Yongning Monastery in the Northern Wei capital at Luoyang which was recorded to have been nearly a thousand feet high. Begun in 516, it burned down in 534 in a great fire that became a symbol of the fall of the dynasty. Perhaps for this reason the favored architectural type of stūpa beginning in the succeeding the Eastern Wei and through the Northern Qi was a modest single-story structure with domed roof, which may be seen to refer back to earlier, possibly Ashokan, prototypes. The remaining evidence of the exterior façades of most of the Xiangtangshan caves indicates that they were modeled on wooden architecture carved in stone with a domed roof shown in relief at the top. Some caves still have a porch preserved in front showing the details of post and lintel construction and bracketing to support a tiled eave over the entrance. These exterior features are best preserved at Cave 7 of the Southern Group. Many smaller relief stūpa-shaped niches are carved in stone inside the caves, on the mountainsides nearby, and at other temple sites in the region. 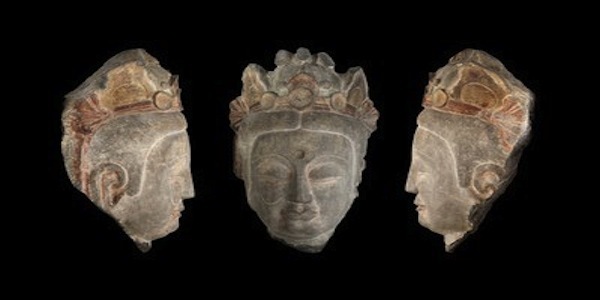 Miniature domed stūpas also appear floating, or supported by flying divinities, above entrances to caves and above the main images of the Buddhas and other deities on Buddhist steles of this period. 2] The principal sculptures are groups of Buddhist images set on altars in the central pillars or against the walls of the caves. The interiors of the Xiangtangshan stūpa caves are of two principal types, the central pillar cave and the chamber with altars on three walls. In the latter type the images may be placed in three large niches set into the walls or on a continuous platform extending around the walls of the cave. The main image groups consist of a Buddha as central figure with two, four, or six attendants. The standing attendant figures include bodhisattvas, disciples and pratyekabuddhas. Sculptors carved most of the main images while hollowing out the space of the caves. The figures have full volumetric forms in spite of being attached to the walls behind them. Others were originally carved in the round and then set into pedestals and thrones on the cave altars. Subsidiary figures appear in relief—heavenly apsarases and musicians, kneeling monks, lions, spirit kings, guardians, and rows of small “thousand Buddhas”, located on the front of the altars, on the back of niches, on walls and ceilings, in cave entrances and on the exterior facades. In addition there are fearsome monsters that kneel and support columns at the side of niches, donor figures, paradise scenes, and narrative episodes from the life of the Buddha. Other elements include relief carvings of lotus blossoms, precious jewels, incense burners. The richness of the imagery is further supplemented by ornamental floral, flame-like, and interlaced scrolling patterns that appear in the halos of figures, on pillars, and in doorways. 3] The engraving of Buddhist scriptures, or sūtras in stone is an important innovative feature of the Xiangtangshan caves. Northern Qi Buddhist devotees appear to have initiated his practice in the area of Ye. Sūtra engravings appear at both the Northern and Southern Groups of Xiangtangshan Caves. Most notably, the South Cave or “Cave of the Engraved Scriptures” at the Northern Group has extensive sutra engraving work that was sponsored by the official Tang Yong from 568-572. This practice spread to other sites in the area of the capital, most notably Wahuanggong in Shexian, Hebei, and from there to other parts of northern China by the late Northern Qi period. In Shandong province, most of the engravings are in natural settings without caves, on cliff faces, on the sloping sides of mountains, or on large boulders, as seen at Taishan, Tieshan, Gangshan and other locations. Sūtras are texts believed to have been teachings of the Buddha and are therefore a type of relics, relics of the Buddha dharma, and appropriately housed within or associated with stūpa caves. The Northern Qi dynasty (550-577) was part of the Northern Dynasties period (420-589) when the northern part of China was controlled largely by non-Chinese Xianbei rulers who first established the Northern Wei dynasty in the late fourth century through military conquest. The Northern Qi patriarch Gao Huan established the Eastern Wei dynasty (534-550) after the fall of Northern Wei and was the power behind the Eastern Wei throne. He relocated the capital to Ye, in present-day Linzhang county, southern Hebei province. This was also the seat of the Northern Qi dynasty, declared in 550 by Gao Huan’s second son, Gao Yang (the Emperor Wenxuan r. 550-59). The dynasty lasted until 577, ruled by a succession of the sons and grandsons of Gao Huan until it was conquered by the Northern Zhou (557-581). The Xiangtangshan caves are located not far from the capital at Ye and on the road leading between Ye and Jincheng (near present-day Taiyuan, Shanxi province), the seat of power of the royal family. Members of the court used the palace and the military outfitting post at the Northern Xiangtang caves site for these regular trips. Though regarded as a period of political unrest and continuing warfare, the brief Northern Qi period saw the arts flourish in a multicultural environment. The close interaction between Chinese and non-Chinese artisans, patrons, and artistic models and influences fostered new, often hybrid, art forms. Xianbei aristocracy and military leaders, Chinese officials, artists, Buddhist monks (both Chinese and non-Chinese), as well as foreign traders, entertainers, and official envoys were active participants in the political, religious, cultural, and commercial life of the time. By the late fifth century, the Xianbei aristocracy frequently intermarried with the local Chinese elite. The rulers made use of the traditional Chinese agrarian system to fill their granaries while maintaining their military strength. They sought out the talents of people of various cultural backgrounds to assist in administering their empire, to design and furnish their palaces, temples, and tombs, to supply them with luxury goods, and provide religious guidance. The Northern Qi is artistically a very significant period when the arts of painting and sculpture flourished, and the names of famous artists are recorded in history. Handanshi wenwu baoguansuo. “Handan Gushan Shuiyusi shiku diaocha baogao [Report of the Investigation of the Shuiyusi Caves, Gushan, Handan],” Wenwu, 1987/4. Mizuno Seiichi and Nagahiro Toshio. Kyodozan sekkutsu. Kyoto, 1937. Tokiwa Daijō and Sekino Tadashi. Shina bukkyō shiseki [Buddhist Monuments in China], ( Tokyo: Bukkyō shiseki kenkyu-kai, 1924–31), v. 3. Tsiang, Katherine R., et al. Echoes of the Past: The Buddhist Cave Temples of Xiangtangshan. Chicago: The David and Alfred Smart Museum of Art, University of Chicago, 2010. _____.“The Xiangtangshan Caves Project: An Overview and Progress Report with New Discoveries,” Orientations, 38/6 (2007).